With the Democratic flips in South Charlotte and Mecklenburg County in a number of elections this year (for state house and county commission, in particular), concerns among Republicans have surfaced that Charlotte, and Mecklenburg County, may see no Republican-elected officials in the city's and county's future. 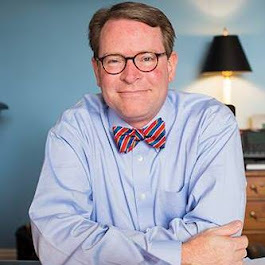 In fact, one Republican member of the Charlotte City Council expressed concern that "We could very well be in the last days of Republicans being elected in Charlotte." But this wasn't a 2018 sudden earthquake, but rather a set of tremors that were building since at least 2004 for the "Republican wedge" in south Charlotte. 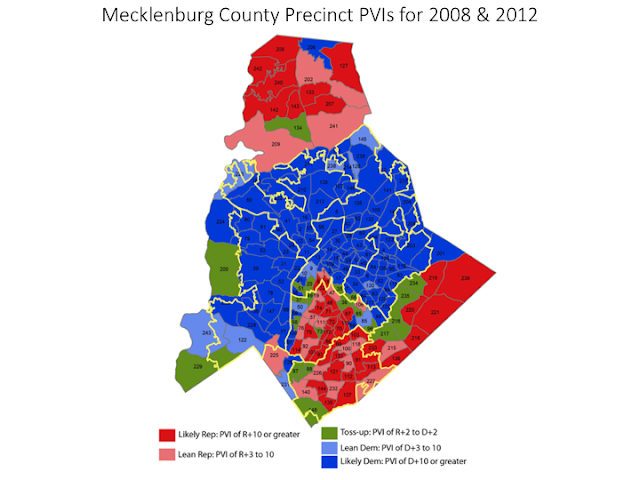 In my analysis of Mecklenburg County precincts, I've looked at the "bluing" of Charlotte, much like the trend of other urban areas across the nation. But the Republican wedge, stretching from uptown into the southern parts of Charlotte, was seen as a GOP stronghold in the Queen City. But that stronghold began its transformation from a strong Republican sanctuary to a competitive, perhaps with a slight blue tint, area since 2004. My approach to analyzing and understanding precinct voting behavior is based on the Partisan Voting Index (PVI), a method used by Charlie Cook at the Cook Political Report. In this index, the state-wide average for a presidential candidate (of either party) is compared to the precinct's results for that same presidential candidate. 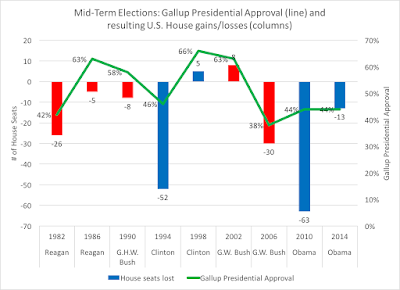 So, in 2004, let's say George W. Bush received 56 percent of the vote, but in a precinct, he received 66 percent of the vote--a +10 for the precinct over the state performance. Then, in 2008, John McCain received 48 percent of the vote, but the precinct went with 53 percent of its vote for McCain, or a +5. Then, taking the two election differences and average them, you come up with an R+7.5 to describe a particular precinct. Then, for each precinct classified, I color coded them based on deep red for strong/likely Republican or deep blue for strong/likely Democratic, lighter shades of red or blue for the lean precincts, and green for 'toss-up' or potentially competitive precincts, where the vote could potentially go either way. Note that in the year George W. Bush won re-election in the Old North State by 13 points and that Barack Obama swung North Carolina to a bare 0.5 percent win, the intenseness of deep blue in the core of Charlotte, but that a "red wedge" emerges and expands out from the middle of the city down towards the bottom of the city and county (in the bottom two yellow-lined city council districts). The suburbs outside of Charlotte, most notably in the north of the county and the southeastern portion of the county, are deep red. Notice the patchwork of "lightening" of the reds in south Charlotte, and in some precincts, the shift to 'toss-up' competitive status. But it's not just in South Charlotte, but in north Mecklenburg as well. The two city council districts in the southern part of Charlotte is still red, but compared to the previous map, it's shifting in the deepness. The other aspect to note: the spreading of deep blues across the rest of Charlotte, expanding outwards in comparison to the previous map. Competitive precincts flipped to lean or strong Democratic. Finally, the GOP wedge of south Charlotte has become more of a toss-up area than a reliable Republican stronghold. North Mecklenburg is experiencing a competitiveness there, while the last strongholds of solid/likely Republican precincts are contained to the extreme southeastern portion and the northwestern corner of the county. And the deep blue of strong/likely Democratic precincts continue to build across the city and, with the exception of the transitioning southern portions, have submerged the Queen City. The northern part of the county, what many believe is a Republican stronghold, is now moving more and more competitive (with the exception of the Davidson blue precinct), like its southern counterparts. While some would be surprised by the results in areas like the NC State House districts of 104 and 105, and what appears to be a truly competitive election in 103, the maps above paint a picture that shouldn't be a surprise. 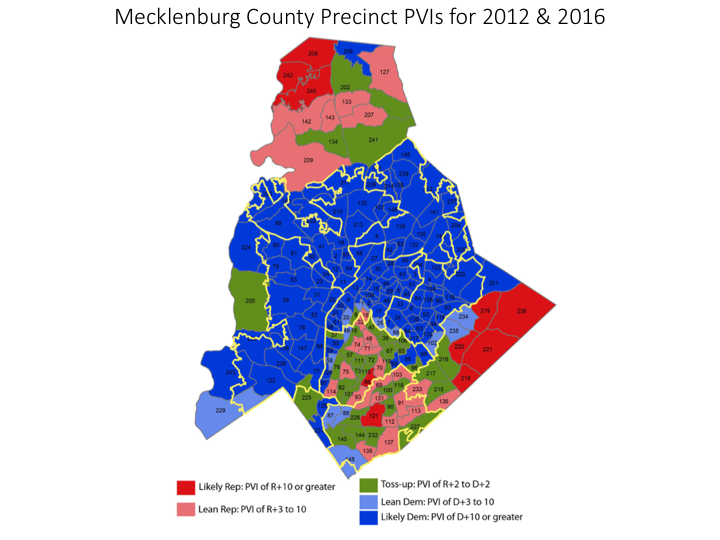 Overlay Mecklenburg's county commission districts that saw Democrats win against incumbent Republicans (districts 5 and 6), and the trend is clear. More analysis will be needed to look within this state house districts to see what kind of voter composition changes have occurred over time, but the very nature of the precinct that make up these Republican suburban districts have shifted under the feet of the GOP. The bleeding of Republican votes in south Charlotte will likely continue, if these trends hold over the next few presidential election cycles and continue down the ballot.